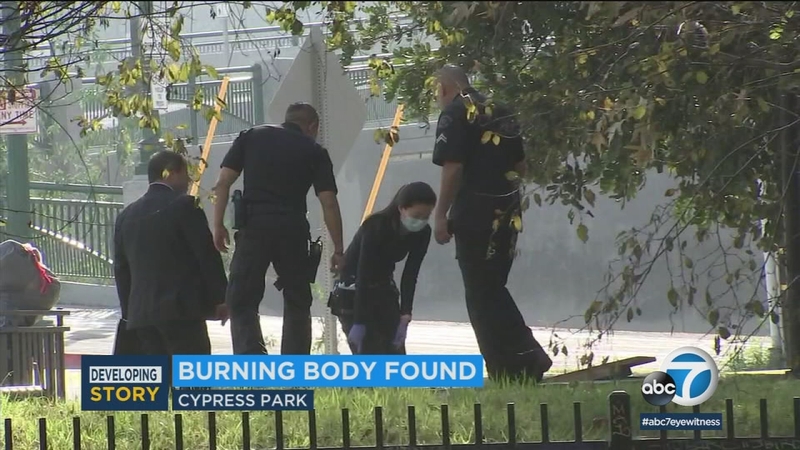 LOS ANGELES (KABC) -- The man accused of killing a woman and then burning a suitcase containing her body parts in a Home Depot parking lot in Cypress Park pleaded not guilty in court Thursday morning. Los Angeles police say Valentino Gutierrez, 56, killed a woman believed to be his wife on Jan. 31 at a Pasadena restaurant near California Boulevard and Arroyo Parkway that had been shuttered and abandoned for some time. According to police, Gutierrez then stuffed her body parts into a suitcase, boarded the Metro Gold Line from Pasadena to Los Angeles with a bicycle and set that suitcase on fire in a Home Depot parking lot. The woman's head is still missing, according to authorities, and she has not been officially identified. Detectives believe the woman is 31-year-old Tiana Alfred, wife of the suspect. Gutierrez has been charged with murder and arson. His next court appearance is scheduled for April 5. If anyone has information pertaining to the case, they are urged to call the LAPD's Robbery Homicide Division. A 56-year-old man was charged with murder in the death of a person whose remains were found burned in the parking lot of a Cypress Park Home Depot.